The current global situation indeed posed a challenge to all economic leaders and business investors. Amid this, the tourism sector has remained resilient with the Department's consolidated efforts in attracting various noteworthy investments to the country. According to the Philippine Secretary of Tourism, "The previous year saw remarkable steady ventures from international firms. Among these is this huge undertaking by Phil BXT, an established resort development corporation, here in the pristine island of Mactan." He added, "Their major decision to invest in the country despite the global economic situation signals foreign investors' confidence in the country's potential and affirms us of the Philippines' viable assets." In November last year, Phil BXT's latest project and newest business development Imperial Palace Cebu Waterpark Resort and Spa, was declared a Tourism Economic Zone under Presidential Proclamation 1681. Officially inaugurated as an eco-zone, with the tourism chief himself unveiling the commemorative marker, Imperial Palace Cebu in Maribago, Mactan is a welcome addition to address the increasing requirement for more tourism accommodations. "This is indeed a tourism and an economic milestone; sending a message of optimism in the industry as the country's top major growth source," Undersecretary for Tourism Planning and Promotions Eduardo Jarque, Jr., noted. Jarque added, "The property, aside from being another major tourism destination in Mactan Island, will certainly complement the popular island attractions of Cebu, as this responds to the need for more tourist accommodations. This growing demand is a positive sign that the country's tourism industry is as vibrant as ever." 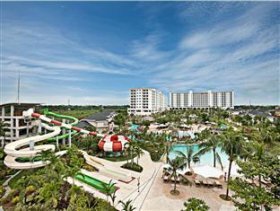 Imperial Palace Cebu Waterpark is located on an 8-hectare property in Maribago, Mactan Island, Cebu, and features 557 contemporary, luxuriously designed deluxe rooms, suites, and pool villas. It also boasts of grand amenities such as a 6,188 square meter pool, a spa, and a private beach. This new attraction is among the biggest investments in tourism development in the country; the first among international chain of hotels set to flourish in the Philippines. "This major venture will give rise to the number of rooms available in the country, which is timely since tourism arrivals in Cebu have increased quite remarkably in the previous year," Jarque said.